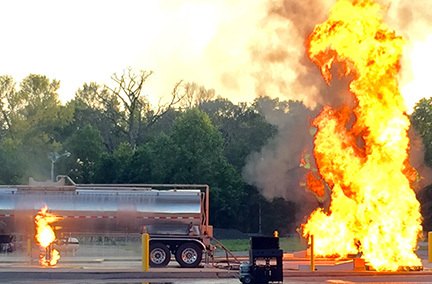 The 40-foot hazmat tanker prop simulates a fuel-spill fire. 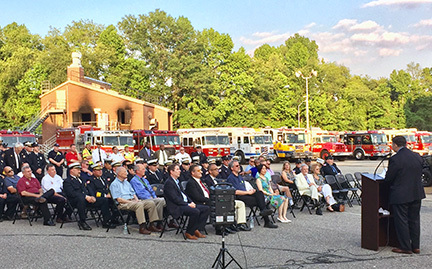 Mercer County Executive Brian M. Hughes addresses the gathering at the dedication of new training equipment June 12 at the John T. Dempster Sr. Fire Service Training Center in Lawrence. LAWRENCE – Significant improvements to the safety and quality of training equipment at Mercer County’s John T. Dempster Sr. Fire Service Training Center were celebrated at a dedication and ribbon-cutting ceremony June 12. The Mercer County Fire Academy, which is directed by Mercer County Community College (MCCC) at the Dempster facility, is used by approximately 2,500 firefighters, dispatchers and emergency medical technicians for training and classroom work. Mercer County Executive Brian M. Hughes was joined by MCCC President Dr. Jianping Wang, Fire Academy Director James McCann, local elected officials and more than 50 firefighters in applauding the improvements, which include upgrades to the residential burn building and drill tower – structures where firefighters learn how to safely attack a live fire – and the purchase of a 40-foot hazmat tanker prop and eight additional propane-fueled props that allow firefighters to train on fire suppression strategy and tactics. The residential burn building had a thermal insulating system added to three rooms and the drill tower had the system added to one room on the fourth floor. The system consists of an outer shell that is stainless steel panels with an inner 2-inch-thick thermal blanket lining. The thermal insulating system protects the brick and mortar of the building from costly damage due to heat. Each room has three thermocouples that measure the temperature of the room during live burn training. This is a safety feature for firefighters that allows a safety officer to monitor the temperatures inside from the exterior of the building. The safety officer will monitor temperatures to prevent any unsafe temperature levels, thus keeping firefighters safe during training exercises. The 40-foot hazmat tanker prop simulates fire from a tanker relief valve and tanker flange, and also simulates a fuel-spill fire; all are fueled through pre-piped propane. The tanker is a modified road tanker that firefighters would encounter on roadways. In addition, the hazmat tanker simulates a leaking tanker with both horizontal and vertical cuts that use water coming from the cuts to simulate leaks from damage to the tanker. Hazmat teams will train on strategy and tactics for mitigating the leaks. The additional propane-fueled props allow firefighters to train on strategy and tactics for those types of situations. The props are commercial Dumpster, horizontal tank, transformer, barbecue grill, split flange, storage platform, paint locker and generator. The $761,870 improvement project included $30,000 in grant money from Bristol-Myers Squibb. Levy Construction performed the construction work and equipment installation. Maser Consulting and Robbie Conley Architects provided engineering and architectural project oversight.